Need a dynamic resume to help launch your aerospace engineering career? Get ideas from our sample resume for an entry-level aerospace engineer. To be a successful candidate for engineering jobs, resume expert Kim Isaacs says it helps to have a comprehensive resume. Are you launching your aerospace engineering career and needing a dynamic resume to get noticed in the job market? 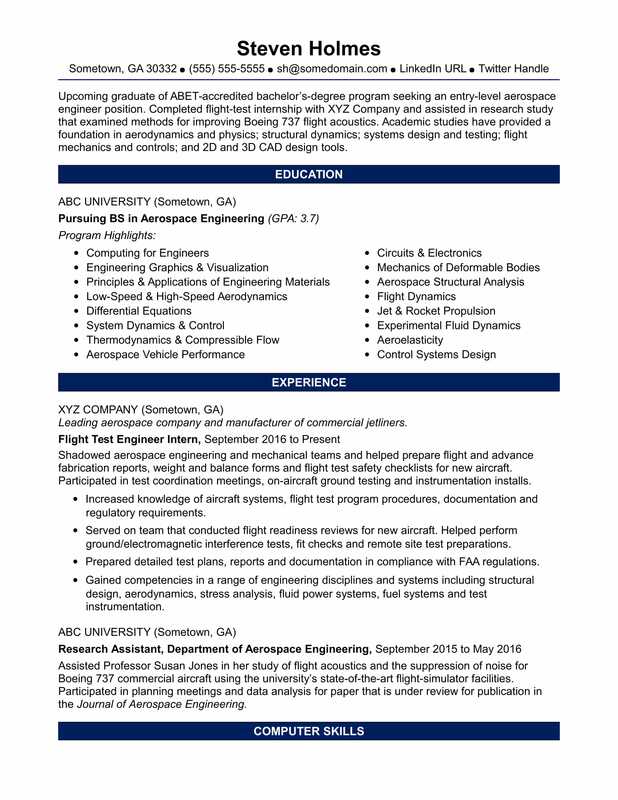 View the sample resume for an entry-level aerospace engineer that Isaacs created below, and download the entry-level aerospace engineer resume template in Word. And if you need more help, let the experts at Monster's Resume Writing Service create a high-impact resume for you that will impress employers. As an aerospace engineer, you can expect to earn a median wage of $113,030 per year, or $54.34 per hour, according to the BLS, although entry-level positions obviously earn less to start. Additionally, you can learn more about engineering careers and search for aerospace engineer jobs on Monster. Upcoming graduate of ABET-accredited bachelor's-degree program seeking an entry-level aerospace engineer position. Completed flight test internship with XYZ Company and assisted in research study that examined methods for improving Boeing 737 flight acoustics. Academic studies have provided a foundation in aerodynamics and physics; structural dynamics; systems design and testing; flight mechanics and controls; and 2D and 3D CAD design tools. Leading aerospace company and manufacturer of commercial jetliners. Shadowed aerospace engineering and mechanical teams and helped prepare flight and advance fabrication reports, weight and balance forms and flight test safety checklists for new aircraft. Participated in test coordination meetings, on-aircraft ground testing and instrumentation installs. Increased knowledge of aircraft systems, flight test program procedures, documentation and regulatory requirements. Served on team that conducted flight readiness reviews for new aircraft. Helped perform ground/electromagnetic interference tests, fit checks and remote site test preparations. Prepared detailed test plans, reports and documentation in compliance with FAA regulations. Gained competencies in a range of engineering disciplines and systems including structural design, aerodynamics, stress analysis, fluid power systems, fuel systems and test instrumentation. Assisted Professor Susan Jones in her study of flight acoustics and the suppression of noise for Boeing 737 commercial aircraft using the university’s state-of-the-art flight-simulator facilities. Participated in planning meetings and data analysis for paper that is under review for publication in the Journal of Aerospace Engineering. Learn more about aeronautics careers.